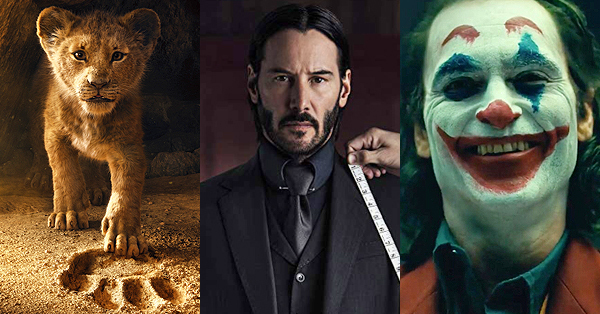 We look at the familiar faces, new costumes, and mysterious new character that show up and break down what it all might mean. 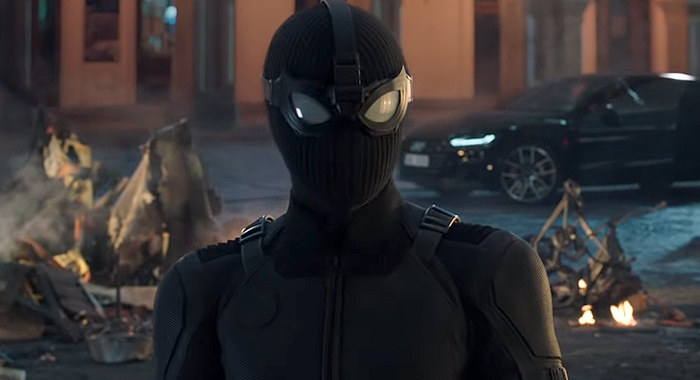 Sony unleashed the first teaser for this summer’s Spider-Man: Far From Home earlier today and it (seemingly) offers the first real glimpse of the Marvel Cinematic Universe’s Phase IV. It also offers a good look at the film itself, which revolves around Peter Parker (Tom Holland) and his classmates taking a European summer trip to cites like Venice and London. And while Peter plans to leave Spider-Man at home for the trip, a surprising guest star has other ideas. 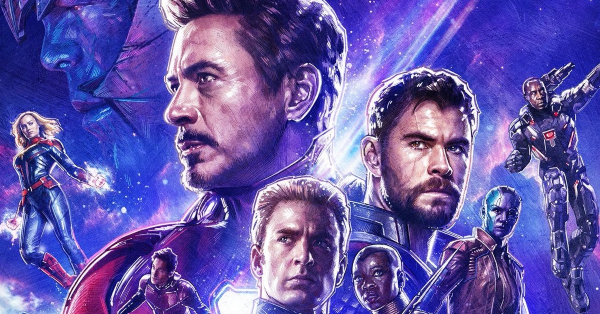 Considering the secrecy revolving around the film prior to the Avengers: Endgame teaser, that is quite a bit of information to be confirmed in a two-and-a-half minute preview. Thankfully, the tease also offered a few more bits of information. 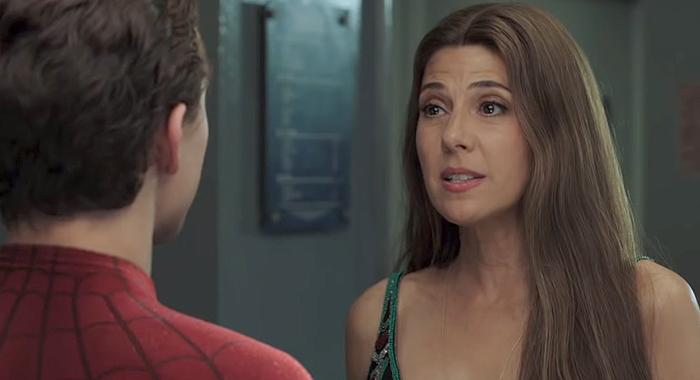 Effectively resolving the joking cliffhanger at the end of Spider-Man: Homecoming, the teaser opens with Aunt May (Marissa Tomei) running a benefit for a homeless shelter. The guest of honor is Spider-Man and the two trade a congratulatory high-five and hug after the event. Clearly, May is okay with Peter’s life as Spider-Man. On film, the notion that Aunt May explicitly knows Peter’s secret is new ground. The previous cycles play with the idea she suspects, but seeing her actively utilize Spider-Man’s celebrity is a pleasantly radical concept. Of course, May’s understanding of Spider-Man’s relationship to Peter has varied in other media. In the recent Marvel’s Spider-Man video game, May tells Peter she always knew; suggesting this shift in the character will become a lot more permanent across various Spider-Man outlets. Which only makes sense. It’s hard to keep a secret from someone who does your laundry. 2. Oh, Hi, Nick Fury! 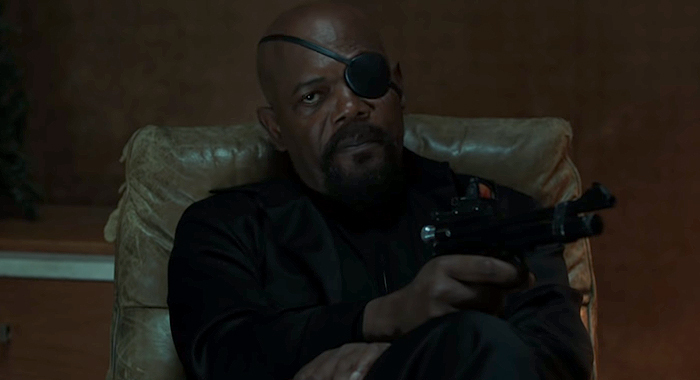 While confirmed last summer, Nick Fury’s (Samuel L. Jackson) appearance in the teaser still comes off as a surprise. Here, he serves as M to Spidey’s Bond – particularly in that shot with the two of them on the motorboat – a relationship first outlined in the 2012 Ultimate Spider-Man animated series. 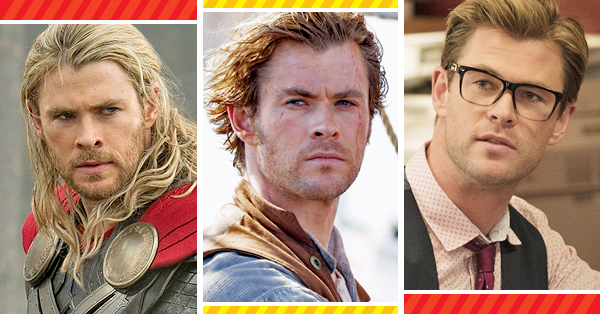 Taking Peter under his wing, Fury mentored him for a significant portion of the series. In Homecoming, Tony Stark (Robert Downey Jr.) took over the mentor role as Fury was still playing dead after the events of Captain America: The Winter Soldier (nevermind that he showed up in Avengers: Age of Ultron with a fully functioning helicarrier). But as S.H.I.E.L.D. is still something of a rogue agency, it is unclear if Fury and Maria Hill (Cobie Smulders) have restored it following Endgame or set out on their own. 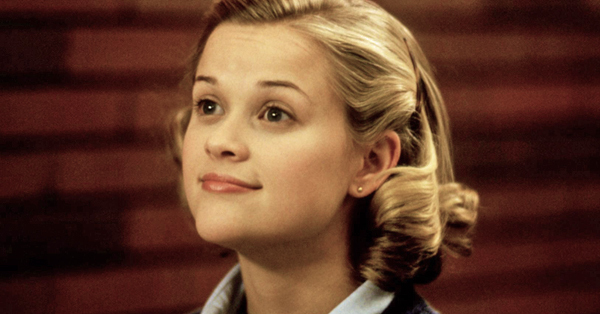 Remember when she got a job at Stark Industries? That never really seemed to take. Also, considering both turned to dust at the end of Avengers: Infinity War, we’re going to assume a pretty positive Endgame outcome. Unless, of course, Far From Home is actually set before Infinity War, but Marvel Studios has been open about the film’s post-Endgame spot in the timeline. 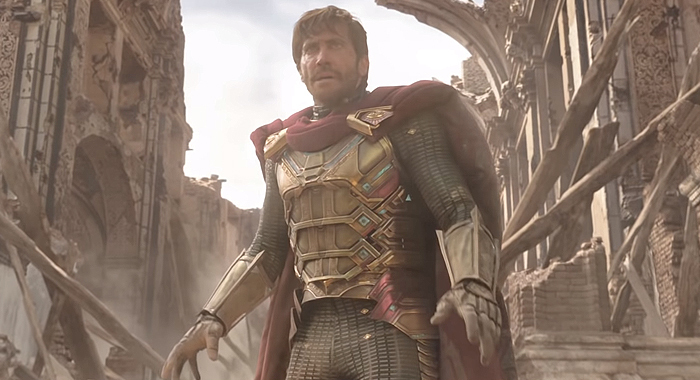 After a long time on the bench, Mysterio is finally making his feature film debut in the form of actor Jake Gyllenhaal. And, it seems, the character will be going back to his roots by creating a false threat. In his debut story, The Amazing Spider-Man #13, special effects wiz Quentin Beck used gas to stymie Peter’s Spider-sense and devised a means to counteract his webbing. He also framed Spider-Man for a bank robbery. He would continue to use his gift for creating illusions to baffle Spider-Man, his friends, and even Aunt May for decades to come. And in Far From Home, it appears the monsters Peter faces — known in Marvel Comics as The Elementals — will turn out to be Mysterio’s creations. Considering his only line in the trailer is “you don’t want any part of this,” followed by a shot of him battling the water monster, we’re going to guess Mysterio plans to set himself up as a counterfeit hero to divert attention from his real scheme. And, y’know, framing Spider-Man may still be part of that plan. He gets framed at least three times a year. It wouldn’t be a Spider-Man movie without Peter getting a new Spider-suit. And the black, armor-padded one glimpsed in the teaser echoes the look of Spider-Man Noir from the comic book of the same name (and the inspiration for the character featured in Spider-Man: Into the Spider-Verse), though it also shares some similarities to the “Dark” suit which first appeared in Spider-Man/Deadpool #8. For incredible plot reasons, that suit came into being because Peter talked to Mephisto, the demon who erased Peter’s memory of his marriage to Mary Jane Watson (a very, very long story). The padding also recalls an early armored suit from the 1990s. Spider-Man has had a lot of suits over the years, which means the feature films have a lot of latitude in what they can do with Spider-Man’s look. Also, it seems as though his Stark Industries suit also had an upgrade. It appears to be black and red, with the red taking on a darker hue than before. It looks great on film and we’re going to assume its a replacement for the one he will presumably lose in Endgame. Y’know, once he returns from nothingness. 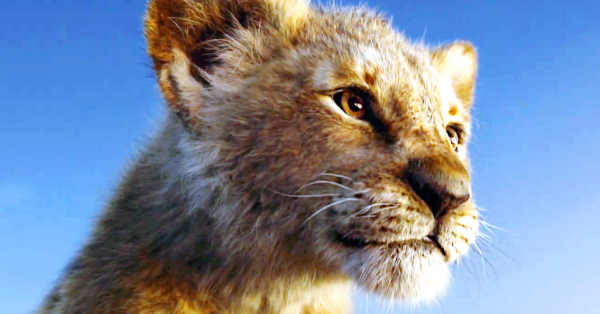 Happy (Jon Favreau) makes two appearances in the trailer. In the latter moment, he seems to be giving Peter some sort of pep talk about saving his friends. But the earlier moment has a lot going on. For one thing, he’s flirting with Aunt May. Granted, just about every straight male in the MCU ends up flirting with her at some point; it is a constant joke in Homecoming. But the silliness of the moment obscures a potentially key detail. 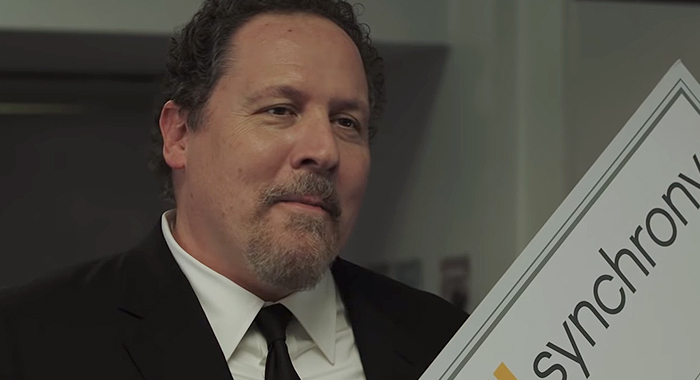 Just before the flirting starts, Happy walks into the homeless shelter’s kitchen with a $500,000 novelty check from Synchrony Bank – purveyors of Marvel’s credit card here in the real world – signed by Pepper Potts. 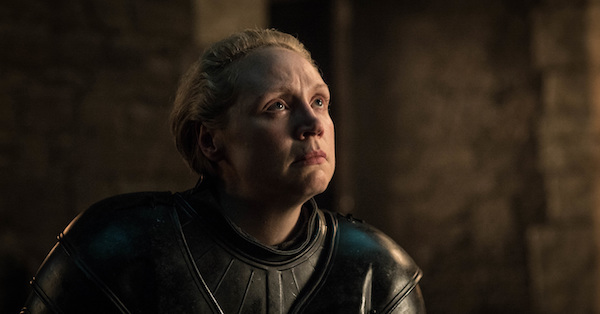 On the check, she is listed as “Co-Founder and Chair, Stark Relief Foundation.” While the organization has been part of the MCU since the Battle of New York (as referenced in Avengers: Age of Ultron and Homecoming), Happy’s appearance and Pepper’s large signature both point to a strange absence in Peter’s world. Where is Tony Stark? 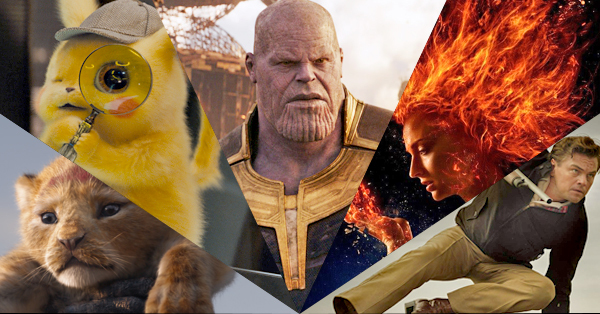 That question puts the teaser – and any trailer that might appear before Avengers: Endgame’s April 26th release – in a precarious spot. Should Tony sacrifice himself for the sake of the universe in Endgame, Peter will feel that loss and, presumably, reference it at some point in Far From Home. But the happy-go-lucky feel of this first teaser works around that possibility. It also suggests the rumored Endgame time-jump may also not occur. Unless, of course, Far From Home is set before Infinity War. But the teaser also features some glimpses of a world still rebuilding itself after “The Snap” and whatever happens in Endgame, so maybe Tony’s absence is just a ruse for those looking too closely. Or, it could be a clue.